Oddly enough, the key to losing weight isn’t about eating less, but eating more. I know, crazy, right?!? If you took one quick look at my waistline, you’d see I got that whole “eating more” thing down to a science. But wait, that doesn’t make sense. If I’m eating more, why am I not weighing less? I know increased activity is one of the main factors in weight loss, and my activity level isn’t even close to where it needs to be for me to have sustainable weight loss, or even no weight gain. Maybe my diet has something to do with it. I don’t eat that bad anymore though. Sure, I have the occasional sandwich from a sandwich shop, and yes, those are high in carbs, but I’ve severely decreased coffee intake thanks to Bulletproof, which has helped decrease my sugar intake, and rarely will you find me eating fast food anymore. So, even with my decreased activity, I should be loosing some weight; I’m still doing pretty good, right? WRONG!! My biggest weakness lies in the thing I actually should be doing, but I’m doing it wrong – snacking. I fall prey to the snack attack every day. Yes Bulletproof coffee has been great for helping me feel fuller in the mornings, but those cravings still come looking for me in the afternoon, and let me tell you, they don’t play. I have a semi-sweet tooth, and I love chips and soda. So it’s not uncommon to find me reaching for a candy bar and soda, or a bag of doritos and soda as an post lunch snack. Even during the mornings when I still get a mid morning craving, those are the kinds of snacks I go looking. Soda, chips and chocolate, while yummy, and all kinds of awesome, and will totally satisfy your cravings, do absolutely nothing (positive) for your body in those moments, and provide little to no nutrients that your body is craving. Another negative side effect of choosing sugary or carb-heavy snacks is that your body gets full, but not with the nutrients it needs to properly turn food into fuel, which means your body is still working, but not getting the energy it needs. And the result is that 2pm-4pm crash so many people talk about on a daily basis. When trying to lose weight, and on a proper workout schedule, it is suggested you eat at least 5 times a day, maybe even more, depending on the results you’re trying to achieve. Obviously 3 of those times are meals, which means the other 2-3 time need to be snacks that will be semi-filling, and healthy. This, is where my issue lies; by not choosing the right kind of snacks, my body is not working the way it should, resulting in lack of losing weight, as well as dwindling energy at the end of the day. The hard part for me is, I’m just not a trail mix or veggie stick kind of guy. I need something that’s going to not taste good, but satisfy my cravings and fill me up. That’s why I’m super stoked to try Bulletproof’s collagen protein bars and bites for my daily snacks. 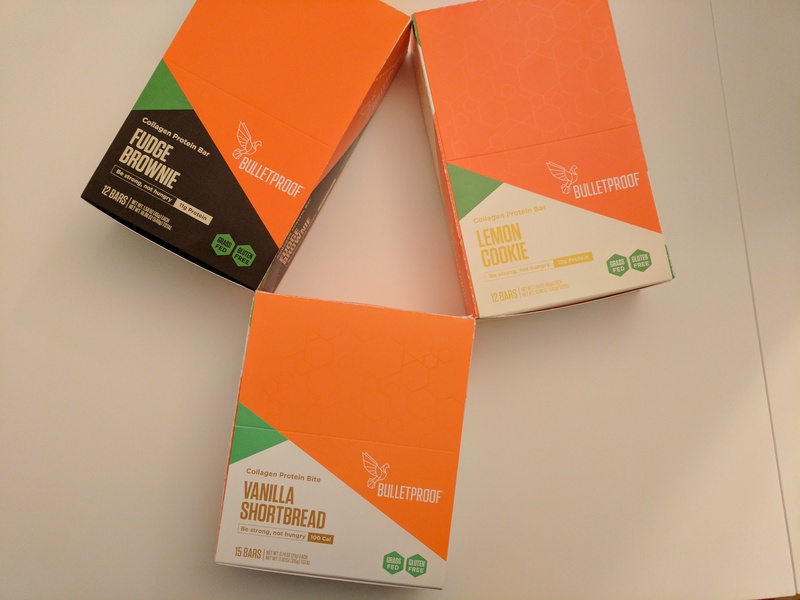 Bulletproof was kind enough to send me their protein bars and some of their protein bites. The bars and bites come in 3 assorted flavors, fudge brownie, vanilla shortbread, and my personal favorite, lemon cookie. I felt like the Goldilocks of the fitness world, and these tasty treats belonged to baby bear…because they were just right (goodness that was a horrible analogy). These really do the trick. The bars, at only 210 calories, are packed with 12 grams of protein, which gives me that fuel I was talking about earlier, have 0 trans fat, are tasty as all get out, and on top of all that…they are gluten free, so they are fantastic and safe for everyone. Now that I’m armed with my new (not-so) secret weapons to combat the mid day snack attack, I’m ready to concur the day once again. Now, just gotta figure a way to get my activity back up. Hmmmm, maybe Bulletproof makes something that can chase me, forcing me to run more, or I can just stop being lazy, and do it myself. I guess we’ll find out when my next box arrives. Until next time!